Lu’s Birthday Birth Story | T.O.T.E. A year ago, at this moment, I was in the process of birthing a baby. This baby, to be exact. I was deep into contractions by this time of night, Andy helping me through each one. Actually, the beginning would be the best place to start a birth story, huh? Well, this is what I looked like in the beginning. Active labor started yet? Nope. That’s pretty obvious by the smile on my face (this particular photo is me being sneaky, because when they asked what Lu’s name was I almost told them, which would have ruined the surprise we had kept for 41 weeks. Mom, who came to the hospital with us, had really hoped to overhear, but I refused to tell). I keep getting ahead of myself. My water broke at home. Just like it did with Mo. No surprises there. When you walk around dilated to 5cm for 3 weeks, it’s bound to happen. At 37 weeks, my midwife said she’d see me next at the hospital. She also said that at my 38, 39 and 40 week appointments… Lu was not amused. So, my water broke, at home. I tried to call to Andy from the bathroom, to tell him what was going on, but our bathroom is tucked into a corner. Then my mom knocked on the door. She hadn’t heard me, she just knew. Mother’s intuition works no matter the age of their Little One. I can’t imagine what it’s like to watch your baby birth a baby…but I’m skipping to the end again. The amniotic fluid had a slightly green tinge. Meconium. Again. I refused to panic. We quietly and calmly packed up the rest of our hospital bag. I remember a muted frenzy all around. People talking in hushed tones, probably both for my sake and also not to wake the sleeping Mo-Bug. I woke her up anyway. I kept it together, not crying, till I saw my sleeping daughter. Andy came in and tears streamed down my face. In that moment we were 3 (on the outside). Next time I saw her, we would be 4. There’s something profound and a little heartbreaking in that truth. We would never be the same. I picked her up, and we took one last three-person family portrait, and then we (Andy, Mom and I) were out the door and on our way to the hospital. As I nervously waved at my in-laws with one hand, and sent “On our way to the hospital!” texts to my friends, I knew we traveled on the wings of prayer and positive thoughts. I called to cancel my 41 week appointment. “Oh! Well, good luck!” said the operator. We checked in, tedious yet energy infused activities followed, like walking the halls, fetal monitoring, more walking the halls. They took my birth plan and the midwife on duty asked if I wanted to get over the pre-labor hump and avoid the normal initial contraction slow-down with pitocin. I politely declined. I trusted that my body would get things started all on its own. 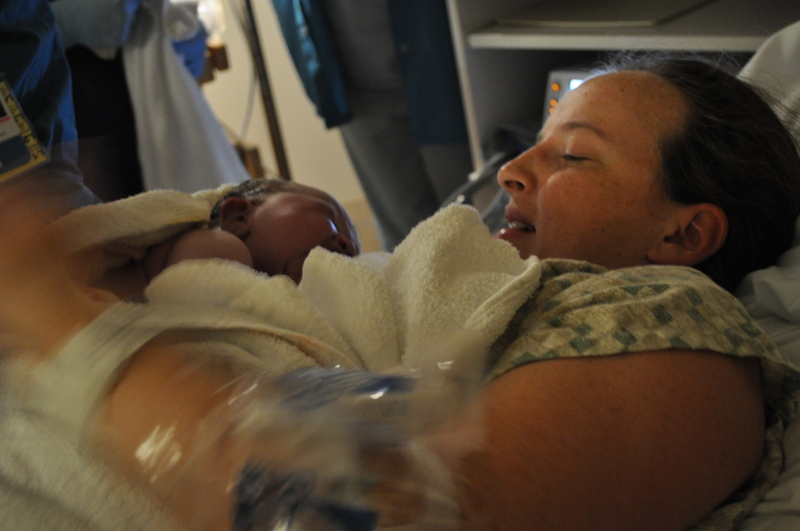 Just as the midwife predicted, I wasn’t really able to focus on labor till we were checked in to our room. However, by 7pm (we got to the hospital around 2:30), contractions were too strong to talk through. I had been laboring in the jet tub, and I remember the midwife coming in and saying something to the effect of “Alright, looks like you’re not smiling now. I would say labor’s definitely started”. From that time on, our care was great. I labored mostly on the birthing ball, leaning forward onto the raised bed or in the bathroom. Andy was amazing support: pushing on my hips, rubbing my back, holding me. Our phenomenal nurse came in every half hour or so to check on Baby with the hand-held monitor. Giving small tips “Verbalize a little lower, relax your face. Let’s try a different birthing ball” all great suggestions that fit within our birthing plan. 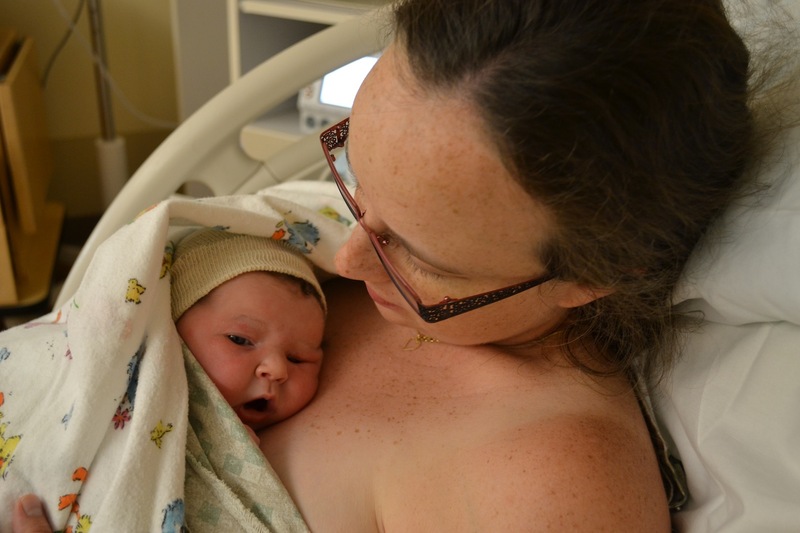 I remember our care being switched to an OB, since midwifes don’t work at the hospital at night on the weekends, and I said, “I know, I have a hippy-dippy birth plan.” She looked right at me and said, “I read your birth plan, and honey, this is Portland. That’s not even close to hippie! Nothing strange about it at all.” From that moment, I knew she was on my side. That’s a good feeling. At some point, walking back from the bathroom, a contraction just about knocked me flat. Providentially our nurse walked in at that exact moment, grabbed my arm and helped me lean on the bed. “I think it’s time to check, what do you think?” she said gently. Yep. It was time. 9cm with a small lip. I remember the energy in the room, and snapshots of the movement and the people. The NICU team assembled because of the meconium. The doctor arrived. 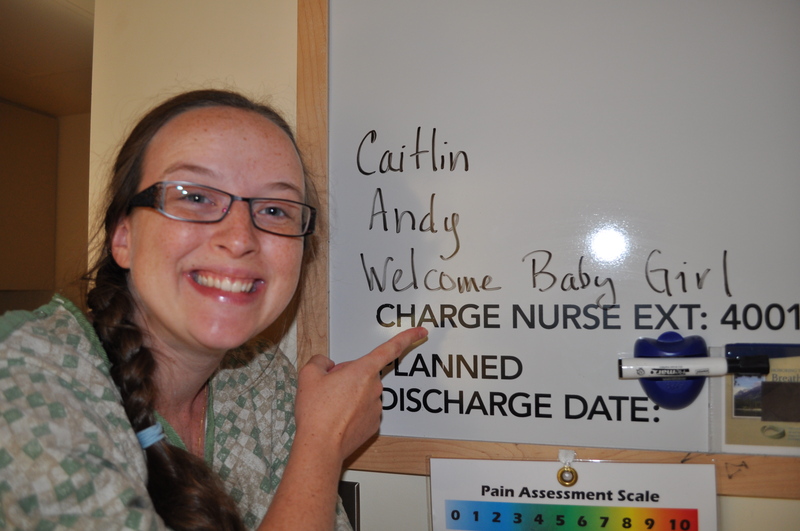 Between contractions, I asked Andy to get Mom so she could take pictures. He held my hand. The pain had been manageable until then. But there, panting through pushing contractions, lying on my side, it hurt. A lot. Tears squeezed out of my closed eyes. And in that moment I felt like a failure. Because it hurt. I know. I know. I sound crazy. Labor hurts! But I felt zero pain pushing with Mo. It was the only experience I had for comparison. This was completely different, and I thought I was weak. They say a woman’s not to be held accountable for what she says during labor. We can say all sorts of crazy things, bad words, yell things we don’t really mean. Just in case you didn’t already think I was weird: all I could say was, “Oh my gosh. Oh my gosh. Oh my gosh.” It hurt like the dickens. And then it was time to push. Time to stop feeling sorry for myself. Time to focus. Time to have a baby. And I did. I looked, and I watched as she came into the world. 18 minutes from the time the OB arrived to when Lucia Jean Labrie Elder was born. The most intense, painful, crazy-awesome 18 minutes. She was immediately placed on my chest. She was blue, and beautiful, and mine. And now on the outside! All 9lbs 12oz of her. Yeah. 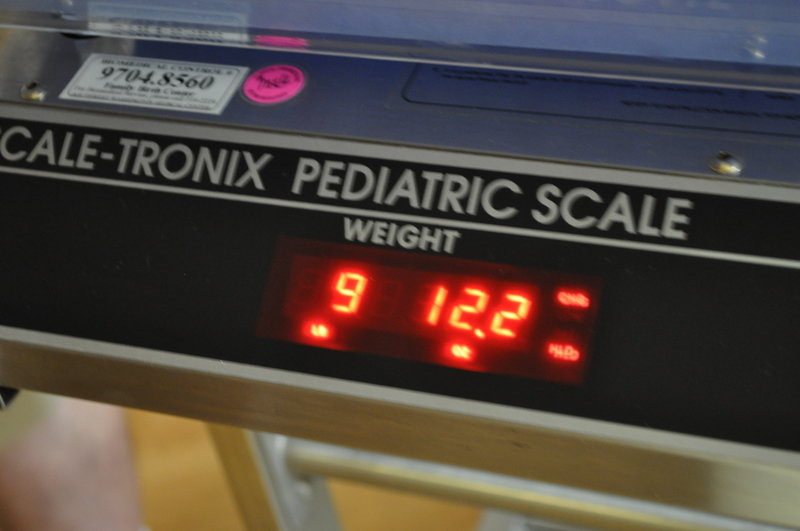 Almost 10lbs. My big girl arrived at 1:28AM. As soon as she cried and rocked her Apgars, the NICU team quickly and quietly left. I appreciated that. Even the doctor commented on what a silent, professional job they did. I was especially appreciative, because of my past experience. Mo spent the first several hours of her life with the NICU team. And thank God for them, but that’s not an experience I wanted to repeat with Lu. 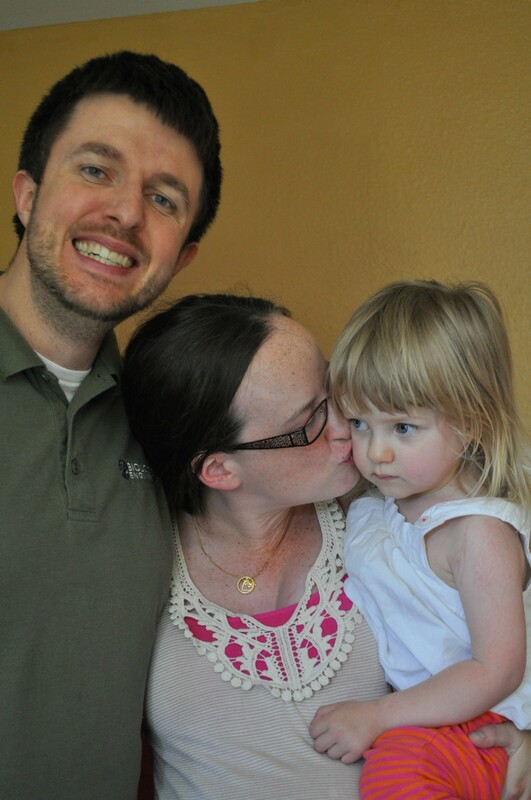 Postpartum was a blur of slight hemorrhage, stitches, a good case of the shakes, and bliss. Tired bliss. The next day was filled with love and visitors. Mo met her little sister. We went home as soon as we could. Tired and happy and now 4. Fast forward to today, and she’s a year old. What?! How?! I must have blinked for too long, because that sure went quickly. 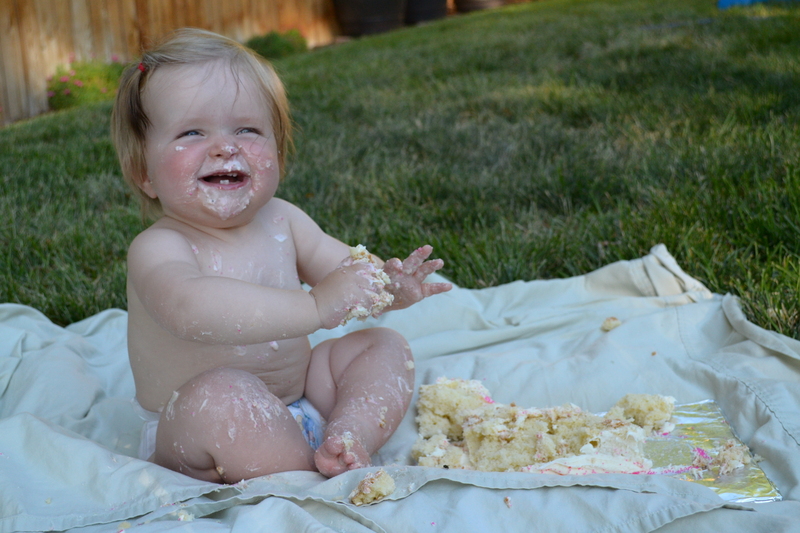 I promised I’d write up your birthday story before you turned one. Here it is. Just in the nick of time. We love you Luci-Lu. Lulu Bell, Lu Bug, Lucia, Lu. More and more every day. Happy First Birthday Beautiful Girl. I’m blessed, especially today, to be your Mama. This entry was posted in Uncategorized and tagged Birth Story, Birthday, Life, Lu, Lu Pic. Bookmark the permalink.